A paleontologist recently proposed to his girlfriend in the acknowledgments of a scientific paper describing a newly unearthed dinosaur species, but says he hopes the romantic gesture doesn’t overshadow the discovery. Caleb Brown of the Royal Tyrrell Museum in Alberta, Canada, is the lead author of “A New Horned Dinosaur Reveals Convergent Evolution in Cranial Ornamentation in Ceratopsidae,” published Thursday in the journal Current Biology. The paper, co-authored by the Tyrrell Museum's curator of dinosaurs, Donald Henderson, describes Regaliceratops peterhewsi, a close relative of the Triceratops that lived during the late Cretaceous Period. The fossil is believed to be around 70 million years old. Brown told The Huffington Post that the dinosaur was nicknamed “Hellboy” because the process of extracting the animal’s skull from the ground was so difficult. He noted that the name also works because of the horned creature’s vague resemblance to the '90s comic book character. 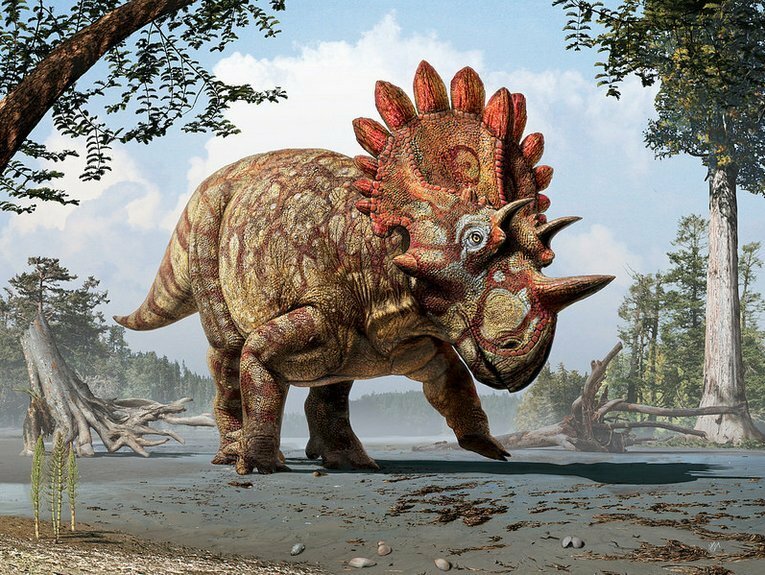 While discoveries of new species of dinosaurs are “fairly common” these days, Brown said, Regaliceratops is particularly interesting because it’s the first example of “evolutionary convergence” in horned dinosaurs. Evolutionary convergence occurs when two groups that are not closely related independently develop similar traits. Brown explained that the Regaliceratops was a Chasmosaurine, a group of dinosaurs that typically had a modest, simple neck frill. The fossil that was discovered, however, had a larger and more elaborate neck frill much more similar to that usually seen in Centrosaurines, another group of horned dinosaurs that lived two million years prior to Chasmosaurines. A news release describes the frill as including a “halo of large, pentagonal plates radiating outward, as well as a central spike,” giving the dino the appearance of wearing a crown. That crown-like appearance is what inspired the dinosaur’s scientific name. "Regaliceratops" is derived from the Latin for “royal horned face,” according to Science Watch, while "peterhewsi" is an homage to Peter Hews, the Alberta geologist who first spotted the dinosaur’s fossil sticking out the side of a riverbank in 2005. “I never expected it to get this much attention,” Brown told HuffPost. He said he just wanted to propose in a “unique and spontaneous” way, and he felt that including the proposal in the paper “immortalized” it.